The Sherlock Holmes of the Pacific War: Ocean Indian Raid Operation or Pearl Harbor Operation ? The following photo has been always considered as one of the iconic illustration of the previous moments to the Pearl Harbor attack, or at taken during the approach to Pearl Harbor in the context of the Hawaii Operation. 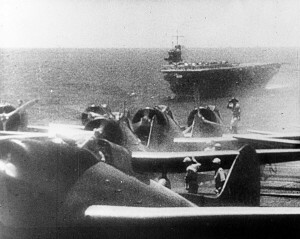 It shows the Akagi Carrier deck with Aichi D3A1 “Val” dive bombers ready to take off. Aichi D3A1 “Val” dive bombers ready to take off from Akagi Deck. However, it may not be so easy. Below you can see the formation of the Combined Fleet during the Hawaii Operation (left) and during the Indian Ocean Campaign (right). The first took place on December 1941 and the second during March-April 1942. By inspecting the formation, it is clear that the Akagi is the lead ship in the Indian Ocean Raid and followed by Soryu Carrier. However, the Carrier Akagi is followed by the Carrier Kaga during the Hawaii operation. Now let’s see the following photo in which two points have been highlighted. The first one is regarding the clothes and uniforms. The crew seem to wear summer uniform with short sleeve shirt. The second point is the formation itself. The shape of the second ship clearly suggests that it is not the Kaga as expected. It is the Soryu, which agrees with the formation of the Indian Ocean Raid Operation. 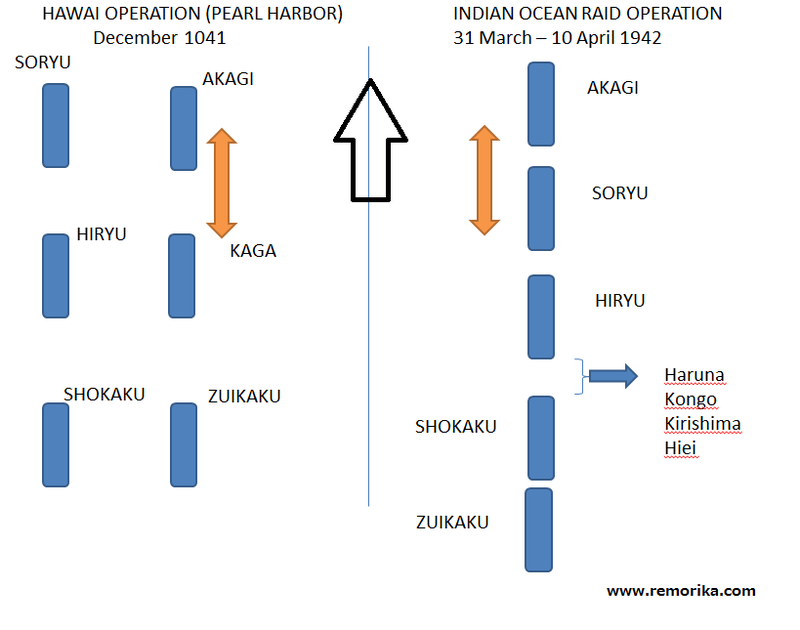 The formation and the uniforms suggests that the operation was not the Pearl Harbor attack but the Indian Ocean Raid. You can notice that Kaga and Soryu carriers had a totally different structure that makes it easy the identification with photo. Of course, you can vote for your own opinion here too!